Pearls in Necklaces | Pearls in Rings | Pearl Earrings & Pendants | Matched Strand of Pearls. Pearl Jewelry Education Necklaces | Earrings | Pendants | Rings | Pearl Information | How to Choose A Pearl Necklace: Look for pearls that are mostly round, with high to medium luster, good uniformity, and minimal surface spotting. Save upto 60% on akoya, tahitian, southsea cultured frehwater & saltwater cultured pearls for anniversary or birthday jewelry gift. Also look at other necklaces like diamond necklace, gemstone necklace with ruby, emerald and sapphire. Present Pearls | Necklaces & Strands | Pearl Jewelry: The pearl necklace DiMaggio gave his bride during their honeymoon in Japan, was a sixteen inch strand of pearls containing forty-four pearls. Pearl is an emblem of modesty, chastity and purity. Wives, mothers, daughters, friends. The special woman deserves a special piece of pearl jewelry this anniversary, to show your love choose from tahitian black pearls, south sea pearls, akoya cultured pearls - pearl strand and necklace with gold clasps, platinum pearl ring, 14k white yellow gold pearl earrings with white, pink and grey color pearls, always a welcome anniversary gift. If you are looking to buy fine necklace browse our Pearl Jewelry (Rings, Earrings, Pendants & Necklaces Guide. Pearls in Necklaces | The Pearl Necklace | A Strand of Strung Pearls: A pearl strand is a length of strung pearls. The meticulous matching required to create superior necklace can take up to a decade. Each pearl is individually selected until we attain a perfectly balanced pearl strand. 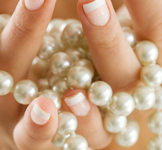 Luster is the most important factor when viewing a quality pearl strand. These pearl strands & pearl necklace are knotless which gives a smoother look to the pearl necklace. High-quality pearl strand & pearl necklace should consist of strands of pearls of high luster and good surface quality, and the pearls should match in terms of color (white, pink or grey), shape and size. Pearl strand is an essential element to a woman's jewelry wardrobe. At Sndgems.com, you are sure to get enchanted by merely taking a glimpse of the diamond jewelry. You can find here diamonds blending perfectly with Gemstone, Tahitian Pearls and Gold. The combination of diamonds with gold, ruby and Tahitian pearls gives that additional touch of elegance to all jewelry, from bracelets to pendants, from bangles to earrings, from necklaces to rings... It is here that you can find that special diamond ruby necklace or pearl necklace which makes you look more gorgeous than ever! Pearl Necklace: Matched Japanese Akoya Cultured Strands of Pearls. Look for pearls that are mostly round, with high to medium luster, good uniformity, and minimal surface spotting with 14k white yellow gold clasps. View Pearl Strands | Pearl Color Luster Quality Details. 14K Yellow White Gold Pearl Jewelry - Earrings: Japanese Akoya Cultured 14K Yellow White Gold Pearl Earrings to complement pearl necklace. 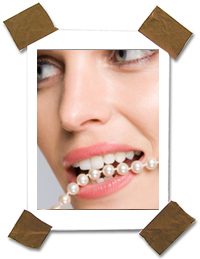 Look for pearls that are mostly round, with high to medium luster, good uniformity, and minimal surface spotting. 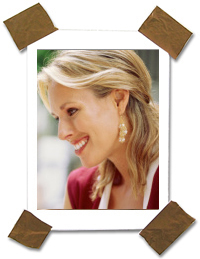 View Pearl Earrings | Pearl Color Luster Details. Pearl Jewelry | Akoya Pearl Rings: Japanese Akoya Cultured 14K Yellow White or Platinum Pearl Diamond Rings. Look for pearls that are mostly round, with high to medium luster, good uniformity, and minimal surface spotting in Platinum & Gold to complement pearl necklace. 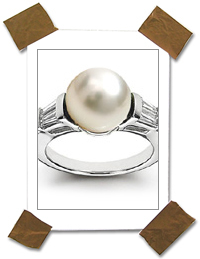 View Pearl Ring | Pearl Color Luster Details. 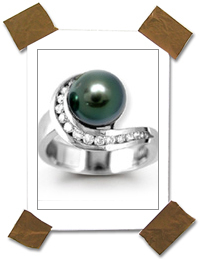 Pearl Jewelry | Tahitian Pearl Rings: Black Tahitian Cultured 14K Yellow White or Platinum Pearl Diamond Rings. Look for pearls that are mostly round, with high to medium luster, good uniformity, and minimal surface spotting in Platinum & Gold to complement pearl necklace. View Pearl Ring | Pearl Color Luster Details. Princess Grace of Monaco wore a wedding gown by Hollywood designer Helen Rose - silk with a bodice of 125 yr old lace. Upon her marriage, Prince Rainier also gifted Princess Grace with a lovely diamond and pearl necklace, bracelet and earring set. View Details. Necklace: We sell rose overtone necklace. View Details. If you decide for any reason that it is not right for you, you can return it to us within 30 days for a refund or replacement. View Details. Can pearl jewelry or pearl necklaces be shipped for next day? Yes.